Performance EFI regulators designed for medium to high horsepower applications. Both regulators feature Aeromotive’s high-flow design, superb pressure control and legendary durability. On the street and at the track, these pressure regulators have logged more miles, more laps and more passes than any other performance EFI regulators in the world! The A1000 Bypass Regulator was designed for use with our A1000 Fuel Pump or any similar style EFI pump in a carbureted application. This regulator is perfect for naturally aspirated or “blow-through” turbo-charged or supercharged engines. The A1000 Bypass Regulator was designed for use with our A1000 and Eliminator Fuel Pumps or similar style EFI pumps in a carbureted application. 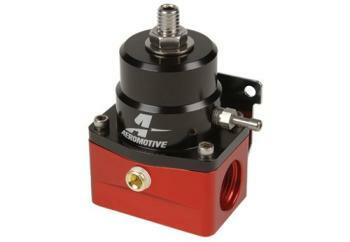 This regulator is perfect for naturally aspirated or “blow-through” supercharged engines.